Epidermoids represent 0.2-1% of all primary intracranial brain tumors. , Intracranial epidermoids are histologically benign and are congenital neoplasms of the central nervous system. As slow-growing lesions, they usually present in the 5 th or 6 th decades of life. The most common location of epidermoid is the cerebellopontine angle and suprasellar region. 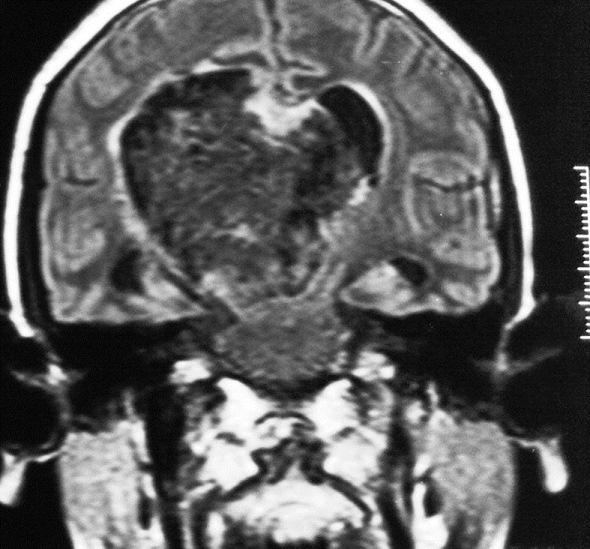 Intracranial epidermoid tumor, arising in the lateral ventricle, is very rare. The clinical presentation is usually non-specific in the form of mental status alteration or headache. A 16-year-old male patient was admitted with a 4 month history of moderate intensity, gradually progressive holocranial headache associated with occasional episodes of vomiting. He also had gradually progressive diminution of vision since 4 months in the left eye. There was no other significant history suggestive of any neurological cause. Vision in the right eye was 6/6 and in the left eye was 6/18 with bilateral papilledema. Power in the left UL and LL was 4/5. Apart from this, no neurological deficit was found. Pre-operative magnetic resonance imaging brain showed a large lobulated, well-defined mass lesion in the atrium and body of the right lateral ventricle, which was hypointense on T1 [Figure 1] and FLAIR [Figure 3] sequences and hyperintense on T2 sequences [Figure 2]. The lesion was compressing the 3 rd ventricle and was displacing the brainstem caudally [Figure 3]. There was minimal periventricular ooze with obstructive hydrocephalus. Pre-operative presumption of glial cell tumor was considered. The patient underwent right parietal craniotomy and complete removal of lesion. 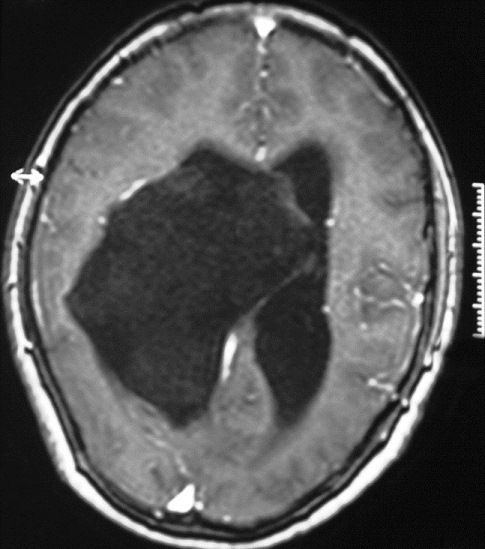 The tumor was pearly white and avascular, occupying the whole of the atrium and body of the right lateral ventricle, and had displaced the septum pellucidum to the opposite side. A post-operative contrast computed tomography revealed near-total excision of the lesion and resolution of hydrocephalus. The patient had normal post-operative recovery and his vision in the left eye also improved to 6/12. At follow-up of 6 months, the patient had improvement in his hemiparesis as well. 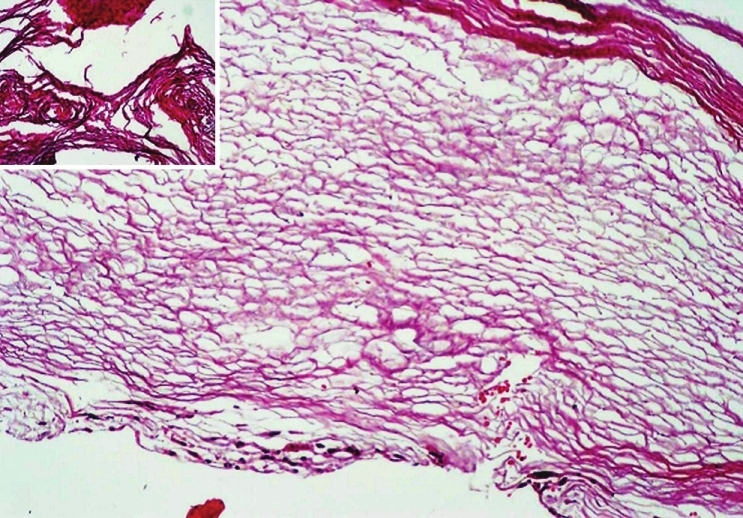 Histopathological examination confirmed lesion as epidermoid [Figure 4]; grossly, flakes of pearly white fragmented tissue were submitted for formalin fixation and paraffin sectioning. The H and E, stained slide showed numerous anucleated squamous cells without any presence of identifiable basal germinal cells. No skin adenaxal tissue like sebaceous glands, hair follicles or mucinous gland was identified. The overall features were consistent with epidermoid cyst. Epidermoid tumors are uncommon, representing only 0.2-1.0% of all intracranial tumors. 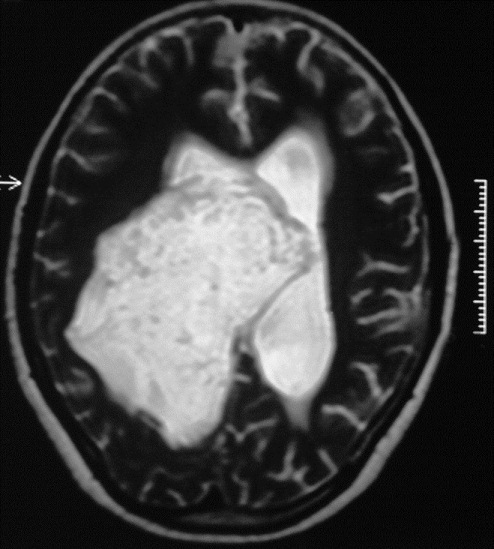 Lateral intraventricular tumors are also uncommon. The number of such cases has not increased in the era of advanced imaging tools. Our literature search yielded only eight reported cases [Table 1]. Pathogenesis of intra-ventricular epidermoids is uncertain. Probably, there is a direct relation to the development of choroidal vessels, which explains the lateral migration through the choroidal fissure and subsequent entrapment of neuroepithelial cells. The tumors reported have a connection with median/paramedian structures, and the view that these lesions commence from quadrigeminal cisterns also needs serious consideration. Epidermoids grow by accumulation of keratin and cholesterol, which are the breakdown products of desquamated epithelial cells. They grow linearly rather than exponentially and hence are slow-growing lesions. Therefore, they clinically manifest in the later decades of life. Because of the rarity of lateral intraventricular epidermoid, no fixed pattern of clinical presentation has been described. Usual clinical presentations described in the literature are non-specific, like headache, cognitive deficit or psychiatric symptoms. Usually, patients with this type of lesions are in the 5 th or 6 th decades of life. In our case, the patient was only 19 years old, which shows that these types of lesions can also present in the young group of population despite their slow-growing nature and enough space to expand in lateral ventricular cavity. In contrast to the present knowledge that the CSF obstruction is not seen even if this lesion is in the vicinity of the foramen of Monro, our patient had obstructive type of hydrocephalus due to compression of the 3 rd ventricle. This resulted in papilledema and diminished vision, which improved after total microsurgical removal of the lesion. Possibly, this is the first case that has presented with diminished vision and hydrocephalus with such a rare type of lesion. Considering the symptomatic and clinical improvement in our patient, microsurgical total removal is a better option to manage these types of lesions. In addition to the rarity of these lesions in the lateral ventricle, intraventricular epidermoid can attain a large size in a short period and can manifest at a young age. It can also cause obstruction to the CSF pathway and can manifest clinically as loss of vision and other features of hydrocephalus. 1. Franko A, Holjar-Erliæ I, Miletiæ D. Lateral ventricle epidermoid. Radiol Oncol 2008;42:66-8. 2. Bhatoe HS, Mukherji JD, Dutta V. Epidermoid tumour of the lateral ventricle. Acta Neurochir (Wien) 2006;148:339-42. 3. Akar Z, Tanriover N, Tuzgen S, Kafadar AM, Kuday C. Surgical treatment of intracranial epidermoid tumors. Neurol Med Chir (Tokyo) 2003;43:275-81. 4. Menq L, Yuquanq L, Shuqan Z, Xinqanq L, Chenqyuan W. Intraventricular epidermoids. J Clin Neurosci 2006;13:428-30. 5. Koot RW, Jagtap AP, Akkerman EM, Den Heeten GJ, Majole CB. Epidermoid of the lateral ventricle: Evaluation with diffusion-weighted and diffusion tensor imaging. Clin Neurol Neurosurg 2003;105:270-3. 6. Lepoire J, Pertiuset B. Les kystes epidermoides cranioenccephaliques. Paris: Masson and Cie; 1957. p. 106. 7. Kallmes DF, Gray L. Epidermoid and dermoid tumors: Imaging. In: Wilkins RH, Rengachary, SS editors. Neurosurgery. Vol. 1. New York: McGraw-Hill; 1995. p. 965-76.